JUST SHOW UP AND RELAX! Some detoxifying therapies are intense or intrusive and some are effective and gentle. Some healing therapies are the same - intense and intrusive! I’ve been offering steam sauna ozone sessions for 19 years. It is the most gentle, effective and stunning therapy I’ve ever seen, bar none. In fact, I’ve said that ozone therapy does more good for more conditions than everything else I’ve ever seen, heard about, read about or studied. COMBINED! (... not including the basics of proper nutrition, detoxification and stress reduction). Ozone therapy has not fixed everything... and in some people it takes more time for an effect than in others with whom the effects were instant. These included clients with colds, flus, torn ligaments, depression, bronchial dysfunction, lung diseases, intestinal inflammations, detoxing from chemo therapy, reduced blood circulation, Lyme disease and so many more conditions. At the same time several hundred calories are used up in each session. Are you an a frequent flyer? Are you a plumber? Do you work in an environment with compromised air - car repair shops, tool and dye shops, welding, mining and roofing work? This is the perfect way to spring clean and spoil yourself. perepaid sessions are valid for one year - we accept cheques, cash, e-transfer and credit cards thru the Paypal system. Merrie Bakker, 604-261-7742, text and phone and info@pacificholistic.com in Kerrisdale, Vancouver, BC (if you receive a voice message, we will call back promptly). We do not sell ANY supplements or MLM products. How Do Ozone / Oxygen Sessions Work? Have you ever wondered why steam saunas have been used for thousands of years by virtually ALL European clinics, Native North American people and in many other countries where the pharmaceutical system has not made such deep inroads? burns about 200 - 300 calories per session! Sweat contains more toxins than urine! That's why skin is sometimes called the 3rd kidney. Combined with very safe pro-oxidative therapy, oxygen / ozone is a powerful healing tool that is often used throughout the world, rarely used in North American and which should be wist to be part of everyone's health plan. Read on and find out how oxygen/oxone steam sessions can help you maintain, or regain your health! The oxygen / ozone / steam sauna session takes about 1/2 hour. You sit comfortably in a steam sauna which is detoxifying in itself. During these sessions your pores open from the heat and your capillaries are close to your skin's surface to help cool you - much like on a hot day at the beach. Ozone and oxygen, which surrounds you, enters your body transdermally. Medical grade oxygen is used to create a constant continuous high concentration of oxygen / ozone that bathes you in the steam sauna. The sweating process (our skin is the largest organ of elimination) assists in expelling toxins and gives the normal toxin pathways to the liver, intestines and lungs a bit of a break. This transdermal oxygen/ozone method is one of the most effective and subtly elegant methods ever devised and the best re-oxygenating and detoxifying method that you can offer your body. destroys harmful bacteria and virus', hepatitis, candidiasis (yeast overgrowth), parasitic infections, mycotoxicosis, etc. can improve lung function / improves the ability of red blood cells to pass on oxygen to other tissue / emphysema, asthma, chronic bronchitis etc. Merrie Bakker, 604-261-7742, text and phone and info@pacificholistic.com in Vancouver, BC (if you receive a voice message, we will call back promptly). WHY should you use OZONE (O3) and the cute accent is extra! an Ode to Tesla - Ozone therapy !!! Here’s an abstract by F Sweet, MS Kao, SC Lee, WL Hagar, WE Sweet from way back in 1980 – Science: 1980 Aug 22;209(4459): 931-3. Increasing and strengthening white blood cells. Decreasing lactate levels preventing its conversion back into glucose through gluconeogenesis and pH improvement. There are many folks who quote Otto Warburg in regards to his work showing that cancer cells have an anaerobic internal environment – requiring fermentation to survive as opposed to a healthy cell which needs oxygenation. So let’s look at the myths… he ‘only’ received one Nobel prize - for the discovery of an enzyme which he called iron oxidase. There was NO nobel prize for cancer cells being flooded with oxygen. He was brilliant, but never produced research showing that cancer cells cannot live in an oxygenated environment – pinnochio made that one up and many others ran with it.... If, after all, it were that easy, we’d just go scuba-diving or sit in a hyperbaric chamber to resolve cancer challenges (neither work). 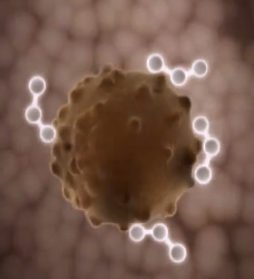 Cancer cells, like regular cells, actually need oxygen and sugars to survive. However, the cells’ response to ozone (including singlet oxygen) is a different matter. Healthy cells deal nicely with an influx of O. Medical grade O2 is zapped by a cold corona / cold plasma process (electricity which breaks down O2 into singlet oxygen molecules) and becomes O3 and all the way through to O25. These are ‘GOOD’ pro-oxidative molecules, always circulating in our bodies (but not in amounts as great as when receiving ozone / oxygen therapy. These are stimulating interferons; stimulating Natural Killer cells; stimulating the white granular macrophage cells; reacting with the lipid peroxide on cell surfaces and much more. The former aspects boost immune functions and the latter cause the O, O3, O4 etc, to enter through cell walls after reacting with the lipid cell membranes. These extra O’s permeate the cancer cell walls as well as the healthy cell walls – it’s an equal opportunity barrier! Cancer cells don’t have the enzymes within to break down the extra peroxide intrusion. It swells; it bursts; the O’s re-merge and re-permeate into the nearest surrounding cancer cells; a chain reaction is created. Peroxide, for example, is one source of oral O3… and this is a verrrry slow and tricky way to create detoxification and healing (for example, some naturopaths have suggested one food grade drop in a glass of water, then two drops, then three, etc). Yet oral ingestion is not the best route (via the stomach and intestines). Injection into a tumor, for example, is a unique and tricky procedure and useful when one has a surface cancer or a very well versed physician who knows how to inject the tumour itself without hitting ANY blood vessels – a procedure requiring extreme skill and a minute amount of peroxide (not taught in North American medical schools!). This is not an acceptable procedure in ANY North American mainstream cancer clinic. Invasive therapies should be performed only by top-notch medical professionals. Buyer Beware! Merrie Bakker 604-261-7742 phone and text and info@pacificholistic.com in Vancouver, BC (if you receive a voice message, we will call back promptly). It stimulates the production of white blood cells, which are necessary to fight infection. It increases oxygen and hemoglobin disassociation, thus increasing the delivery of oxygen from the blood to the cells. It increases red blood cell membrane distensibility, thus enhancing their flexibility and effectiveness. Bio-oxidative therapies increase the production of interferon and Tumor Necrosis Factor, which the body uses to fight infections and cancers. Bio-oxidative therapies increase tissue oxygenation, thus bringing about patient improvement. Also very informative: a few comments by Ed McCabe, a solid researcher and long-time advocate of oxygen / ozone therapies: https://www.youtube.com/watch?v=RJWhUx8hcOk - from 38:00 minutes into it to 39:55. A new medical discovery in Brazil may help in the fight against this dangerous bacteria which is often resistant to antibiotics. University of Sao Paulo researchers led by Dr. Glacus Souza Brito have proved the efficacy of the gas – ozone in the multiresistant bacterium Klebsiella Pneumoniae Carbapenemase, which has caused 319 cases of infection and 46 deaths in Brazil between August, 2009 and October, 2010. Studies conducted over a year and multiple tests were necessary to conclude that ozone is capable of killing the bacteria in five minutes. The research was conducted with no sponsors from any commercial company or laboratory.It is necessary to underline that the ozone therapy in Brazil, in spite of the enormous efforts on the part of the Brazilian Association of Ozone Therapy is not still regularized. Let’s hope that with these findings the Brazilian administration will recognize as simple fact about ozonotherapy: it works. If It Is So Great, Why Isn't Everybody Using It? If a mainstream therapy has a lot of side effects and targets predominately symptoms, why would it still be used and prescribed as is often the case? The answer has to do with the "business" of medicine rather than the actual practice of it. The flip side of this answer is: any alternative therapy would be mainstream if it were more profitable than the therapy it replaces. It is not physicians who decide what is allowable and what isn't. It is the pharmaceutical complex and their companies and other members of the medical industry / establishment / governemnt institutions that make these decisions. In other words the bottom line is always best served with therapies and meds that treat symptoms expensively and nor those that cure the root cause. Another reason is that any treatment, to be accepted as mainstream, requires expensive (upwards of 2 million dollars) FDA mandatory testing - double blind cross-over and published in mainstream journals supported by big pharma dollars. Treatments and therapies that are not looking to be exceedingly porfitable will not be able to generate this amount of needed research funding and never leave the starting gate. Efficacy is important in our health/disease care system, but not as important as profits. What could be more profitable than a therapy / treatment that eases symptoms while at the same time not curing the the problem? Ozone / oxygen therapies will always remain alternative rather than become mainstream and acceptable, as long as the present profit paradigm in health care prevails - repulsive as this may be to both physicians and all of the rest of us needing attention. Thinking outside of the crammed and limited profit box is only seen sporadically, silently and stealthfully. Why Does Ozone Have A Bad Reputation For Health? Unfortunately about the only time that any of us hear about ozone in the news is in the context of pollution. It is even perceived, incorrectly, as being part of, or even a major ingredient in pollution (even by some "scientists"). When we began creating pollution - hydrocarbons (known as peroxides) - with the invention of combustion engines and factories, ozone in the higher stratospheres, began to react with pollution's molecular double bonds. Atmospheric nitrogen is also involved (air is 20% oxygen and 80% nitrogen, ideally) and nitrates also became involved in this air-borne pollution. Scientists in this past century had to find a way to measure the amount of smog in the air. They picked on ozone, not becuase it was evil or the most irritating or the main constituent. It was because it closely correlates with the amount of pollution present in the air; because it is easy and inexpensive to measure; and because measuring any of the other main constituents of smog is very expensive and complex. So high ozone levels ONLY means high peroxide and nitrate levels - which cause substantial respiratory injury. One reason that scientists are quick to jump on the 'ozone-is-equal-to-bad-stuff' bandwagon, is that when one looks up ozone at Medline, almost all references are about the toxic effects on pulmonary tissues - a very narrow application at best. Just How Does It Work In Our Bodies? When we are seriously ill; when our pH is seriously out of kilter; when we are receiving harsh chemical therapies; when we are over-the-top stressed; or when we are recouping from the side-effects of anti-biotics, etc., the transport of oxygen (to all of our cells) becomes less efficient and sometimes compromised. Then the massive amount of normal complex reactions, onging at all times to keep us functioning, are also affected, compromised or diminished. Knowing the exact biochemical and physiological mechanisms behind this therapy is important and known to a great extent and yet more research is required. This will also shed more light on the complete mechanisms of how oxygen itself is metabolized in the body while all is well and working perfectly (something we also do not know definitively). Oxygen has been used for one full century to promote health and healing - mainly in Europe, Russia and Cube. Oxygen / ozone has always been part of some very useful and effectve therapies - please see the amazing compilations below by Ed McCabe and Dr. Frank Shallenberger - researchers and authors of many articles, books, videos and practitioner courses. Who Uses Steam Heat Oxygen / Ozone? You have nothing to lose (except for a few hundred calories and a lot of toxins) in the process! Is the first step the most challenging? Just call and ask what is on your mind or schedule an appointment. Merrie Bakker 604-261-7742 text and phone and info@pacificholistic.com in Vancouver, BC (if you receive a voice message, we will call back promptly). The most common question for those who understand a bit about the body is "how can one reverse oxidative stress by using oxidant material?" In a small enough dose, which is what is provided in a steam sauna trans-dermal setting, oxygen / ozone acts to stimulate the anti-oxidant systems that act to decrease the oxidant stress associated with so many health challenges. The notion that excessive oxidant production leads to disease and dysfuntion makes no sense, as there is nothing as biologically important as an adequate supply of oxidants. "Contrary to the dogma that the super-oxide anion and hydrogen peroxide formation are very highly deleterious to cell function and healthy aging, we suggest this premise is flawed... The latter two play an intrinsic role in the regulated turnover of proteins, rather than randomly causing damage and inactivation." Anti-oxidant stress is caused by a lack of adequate anti-oxidant buffering capability, so stimulating an increased synthesis of anti-oxidant buffering enzymes is what subtle oxygen / ozone therapy also does. External oxygen / ozone "bagging" of legs is gentle and highly effective. A special bag is wrapped around the affected limb(s) and oxygen / ozone flows into the bag and constantly keeps the limb bathed in it and surrounded - this is highly effective in treating leg and toe ulcers, persistent sores, lesions, and diabetic related infections, etc. The results can be rapid. Surgery and amputation for diabetic related infected toes reversed. Many happy feet are still with us because of this simple form of oxygen / ozone influsion. There are many methods of detoxification. Some methods, called chelation, are with the use of IV-applied chemicals such as EDTA, DMPS and DMSA - very good if your health is very seriously compromised and a fast and serious intervention is a matter of life or death. These are usually done at a naturopath's office and occasionally by a very progressive GP or physician. HOWEVER, one should DEFINITELY have all metal dental fillings removed first (esp mercury fillings) before embarking on such a serious and intrusive therapy such as these chelations. Chelation is an extreme pathway to wellness and requires simultaneous, cautious re-mineralization or it could lead to more problems - so buyer beware. This precaution is not necessary with Steam Sauna Oxygen / Ozone therapy. Your head is not part of the steam / ozone / oxygen method. No ozone is breathed in and this adds to the safety. 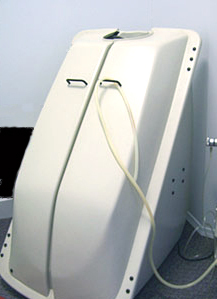 What can ozone / oxygen therapy do for me that the oxygen in my body isn't already doing? Your body continually burns oxygen as part of many functions ~ to convert food into energy, for example. Oxygen is an integral part of natural internal detoxification, as another example. If there is a continuous or intermittent insufficiency, an imbalance and eventually disease, can be the result. Lack of oxygen not only causes pH and physical imbalances and ailments, but also mental sluggishness, foggy thinking and even depression. This is common yet unnecessary ~ and not always needing heavy medication (that should be your last resource). Also, no self-respecting pathogens can live in an oxygenated / ozone environment - even at the cellualr level. For example, red blood cells that are under-oxygenated are also under functioning - less toxins moving out and less nutritional elements being circulated to where they are needed and this leads to depletion and mal-function. This is where we often see microscopy images of red blood cells all stuck together. OZONE / OXYGEN THERAPY is not a drug nor a magic bullet. It is a simple, elegant, non-toxic and therapeutic tool of great subtle power which can aid the body in regaining health in regards to most challenges and diseases - a smart part of a comprehensive, individualized approach in conjunction with other synergistic modalities or as health maintenance and prevention on it's own. OZONE Therapy Summary and the EBOLA Outbreak. "Many have asked for a concise summary of the wonderful physiological effects of ozone therapy, especially considering the medical mission I undertook with Dr. Howard Robins of Manhattan to Sierra Leone to cure Ebola. I will endeavor on this page to tell you why I instigated the trip and commandeered Dr. Robins to come with me. Please know that this information is merely informative. It is not to make a claim that ozone or any particular therapy might cure any condition, but to discuss the known physiology of ozone therapy, and how that physiology might apply to viruses. "In October 2014, I traveled to Sierra Leone with my colleague Howard Robins to train local health professionals to treat Ebola with ozone therapy. Training went great. We hit a snag. While at the Sierra Leone Ebola treatment center outside the capital, a call came in from the Ministry of Health halting the ozone project. Patients were forbidden to receive ozone, and the staff as well. The staff did continue with our training fearing for their lives otherwise. Patients were denied and left to die.The next page on this site provides you with the published results of our mission. "Ebola, as you know, is a virus. It incubates for 2-21 or so days and then roars to life to induce death. Ebola first tricks the immune system into thinking nothing is there. The virus enters many different types of cells in your body. It multiplies extremely rapidly, emerges from the cell to infect yet more. Interestingly, much of the damage induced by the infections is actually your suppressed immune system awakening and then shooting cannons at everything, inclusive of your own cells. This causes great inflammation, leakages in blood vessels (hemorrhage), extreme oxygen starvation to tissues, organ failure, and a high death rate. "I have diabetes. I cannot walk more than across my apartment and always with pain. I hate going out with my walker. Each oxygen session with Merrie now leaves me pain free for about three days and allows me to walk several blocks without help - I can now make it to the local coffeeshop without shuffeling like an old man.